PHOENIX — The Arizona Game and Fish Department is accepting applications for leftover hunt permit-tags for the 2017 sandhill crane season. A list of the 29 leftover hunt permit-tags, including 22 for youth hunters, is available online at https://www.azgfd.com/Hunting/Regulations/. Applications are being accepted — by mail only – on a first-come, first-served basis – at the following address: Arizona Game and Fish Department, Attn. : Draw/First Come, 5000 W. Carefree Highway, Phoenix, AZ 85086. The hunt permit-tag fee is $43 for Arizona residents, $45 for non-residents (each successful applicant will receive three hunt permit-tags). A valid Arizona hunting license is needed to apply. If an applicant is not licensed at the time of application, he or she must purchase a license by completing the license form section and include payment with the application. 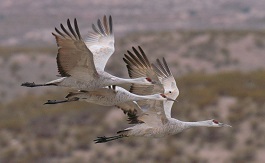 The “2017 Arizona Sandhill Crane Regulations” are posted online at https://www.azgfd.com/Hunting/Regulations/. For more information, call (602) 942-3000.